Uniformity of particle size is important for the operation of the gasifier. Unlike the updraft gasifier types (counter-current) are not too sensitive to the particle size of the raw material, the type downdraft gasifier (co-current) have a particle size uniformity requirement of raw material that more stringent. Pelleting and briquetting is an attempt to obtain uniformity of particle sizes of raw materials, improvement of the quality of raw materials, and transportation savings. Materials such as sawdust, forest waste and empty fruit bunches of oil potential for compressed into pellets or briquettes. 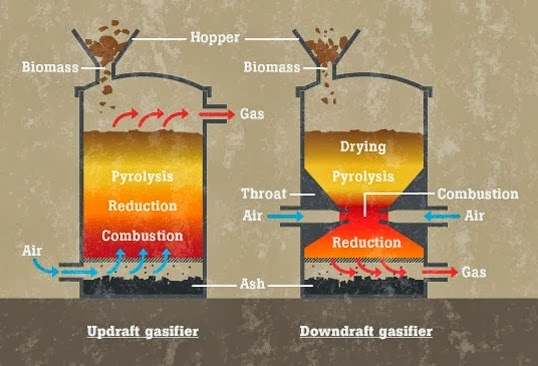 Downdraft gasifier (co-current) will produce a cleaner gas from tar so that subsequent gas cleaning will be easier to do, to then be used as heating fuel, gasoline engines, diesel engines (dual fuel), or a gas engine to generate electricity. Updraft gasifier produces gas from too much dirty tar so that the gas cleaning more difficult and therefore its application mainly to the heat source. Downdraft gasifier applications so that wider and more widely used in a number of industries. The production of briquettes or pellets should be done as close as possible to the raw material (raw material oriented) for technical and economic reasons, and then the product of wood pellets and briquettes can be transported to the gasifier unit location within a specified radius. Special briquettes, just type screw (extruder) are suitable for the gasification process. Gasifier product in the form of heat energy, mechanical energy, and electrical energy can directly be used by the user so that the orientation of the gasifier unit is approaching the user or market (market oriented).